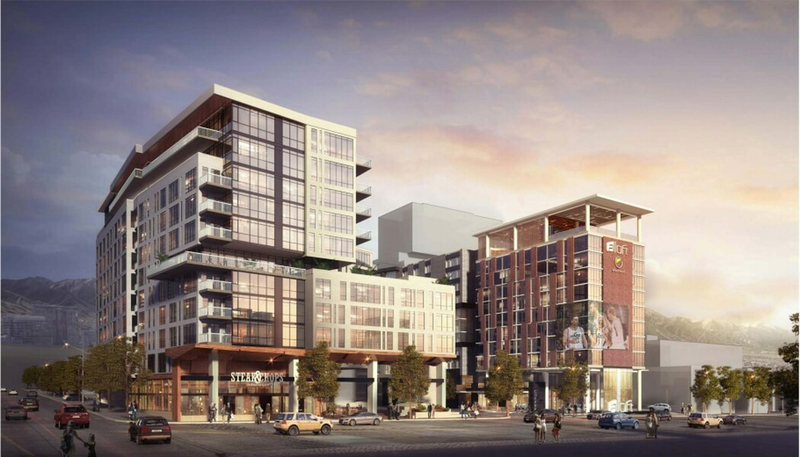 (Courtesy photo) A rendering of The Ritchie Group's proposed Block 67 development in Salt Lake City, as though looking east from Vivint Smart Home Arena. Supporters of Japantown along 100 South fear the mixed-used development featuring two hotels and an office tower could wipe out the historic cultural enclave. Prominent members of Utah’s Asian community worry that a major mixed-use and hotel development planned in downtown Salt Lake City could effectively wipe away a century-old cultural enclave known as Japantown. Most of the historic neighborhood, once a hub for Japanese residents whose ancestors came to work the region’s mines and railroads, was razed in the mid-1960s to make way for a previous version of the Salt Palace Convention Center. But the Japanese Church of Christ and the Salt Lake Buddhist Temple remain on or close to the block bounded by 100 South and 200 South from 200 West to 300 West, known as Block 67. Officials with The Ritchie Group, a real estate developer based in Salt Lake City, envision four new buildings on a 6.45-acre footprint running diagonally through the block, including more than 650 residential units, two hotels, an office tower, retail space, a tree-lined midblock street and an underground parking garage. The project would replace the post office building and surface parking now occupying the block. Opponents say the new development at 230 W. 200 South threatens to smother the area’s cultural legacy and the two religious sites. Resulting traffic from the project’s parking garage, they say, is also likely to overwhelm the adjoining stretch of 100 South, which was dubbed Japantown Street more than a decade ago and is used today for public festivals. Japantown supporters have been working quietly for months to block a zoning change that would increase the allowable height of buildings in the project, a change that developers consider crucial to its success. In recent testimony, Michael Kwan, a Taylorsville justice court judge and president of the Chinese Railroad Workers Descendants Association, likened Japantown’s potential fate to that of a once-thriving Chinatown in Salt Lake City, centered on downtown's Plum Alley. “Over time, it was taken and it was lost," Kwan told the Salt Lake City Council recently. "And now we’re struggling today on how we tell that story, of how we have been a part of this community and the nation at large since the 1860s. "Once you lose Japantown," he said, "you'll never have it again." State Sen. Jani Iwamoto, D-Holladay, warned of a replay of the Salt Palace demolition in 1966, when a string of stores, markets, restaurants and pool halls at the heart of Japantown were torn down. "We hope you can understand and empathize with what this area — what is left of this area — means to our communities and to honor the past, to embrace diversity, to work with us hand in hand and not to repeat history," Iwamoto said. She and others said concerns over historic preservation had only been considered, as Iwamoto put it, "at the back end" of the Block 67 development. Officials with The Ritchie Group said they hope to reach a compromise that lets the project proceed. Jayson Newitt, a company principal, was optimistic about an upcoming meeting with community leaders to address the dispute, brokered by the city’s Redevelopment Agency. "We look forward to finding wins for them and wins for us, make the project work and still pay homage to their past and their great history," Newitt said. After hearings before the city's Planning Commission, the zoning change was set for a City Council vote as soon as Aug. 14, but after hearing residents' concerns, council members opted instead to continue their hearings on the issue. 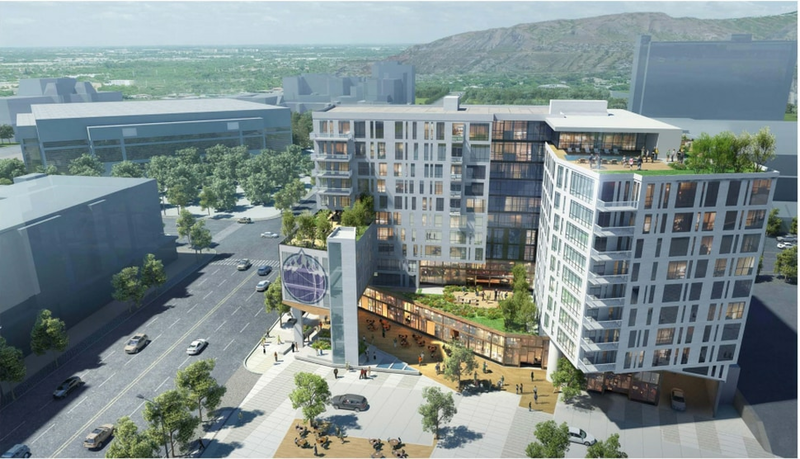 (Rendering by The Ritchie Group) A rendering of The Ritchie Group's proposed Block 67 development in Salt Lake City, as though looking north along 300 West. Supporters of Japantown along 100 South fear the development could wipe out the historic cultural enclave. With its proximity to the convention center, The Gateway shopping mall and Vivint Smart Home Arena, the Block 67 project is seen as a key part of the city’s vision for an active sports and entertainment district on the western edge of downtown Salt Lake City. The arena recently underwent a multimillion-dollar renovation, and the mall is in the midst of one. Officials with The Ritchie Group, who hope to build their project in two phases beginning this year, are seeking approval to construct a tower at the corner of 200 South and 200 West up to 375 feet tall as part of the project’s second phase. Current zoning now limits that maximum height to 75 feet by default and to 120 feet with additional review and approval. Instead of a full rezone that could permit skyscraper-style heights comparable to those in the downtown core, city planners are instead recommending what’s called a zoning overlay, allowing some additional height on that block while keeping other restrictions in place. According to city documents, the overlay was first created to allow for a long-sought convention center hotel at the adjacent Salt Palace. Council members have voiced support for using the overlay on Block 67, but some have suggested an additional buffer zone on its northern edge to lessen visual effects on the downtown skyline of a much taller building surrounded by smaller structures. Opposition has also emerged over the project’s proposed 424-stall residential and commercial parking structure, for which the developer would reportedly receive a sizable taxpayer subsidy from Salt Lake County, to be repaid over 25 years through a deal with the city’s RDA. Salt Lake City Councilman Andrew Johnston said the county subsidy was being made in recognition of the regional impact of the project. But Dave Iltis, editor in chief of Cycling Utah magazine, called the arrangement “insanity,” given what he said is a surplus of surface parking across the downtown area. "We don't need more parking," Iltis told the council. "Parking induces driving. We don't need more cars downtown." Newitt, with The Ritchie Group, countered that while parking was available elsewhere, "proximity is an issue when you do a development.